Nice : Nissa [classical norm], Italian: Nizza) is a city in southern France located on the Mediterranean coast, between Marseille, France, and Genoa, Italy, with 1,197,751 inhabitants in the metropolitan area at the 2007 estimate. The city is a major tourist centre and a leading resort on the French Riviera (CÃ´te d'Azur). It is the historical capital city of the County of Nice. The first known human settlements in the Nice area date back approximately 400,000 years; the Terra Amata archeological site shows one of the earliest uses of fire and construction of houses. Nice (Nicaea) was probably founded around 350 BC by the Greeks of Massilia (Marseille), and was given the name of ("Nikaia") in honour of a victory over the neighbouring Ligurians (Nike is the Greek goddess of victory). The city soon became one of the busiest trading ports on the Ligurian coast; but it had an important rival in the Roman town of Cemenelum, which continued to exist as a separate city until the time of the Lombard invasions. The ruins of Cemenelum are located in Cimiez, which is now a district in Nice. During the Middle Ages, Nice participated in the wars and history of Italy. As an ally of Pisa it was the enemy of Genoa, and both the King of France and the Emperor endeavoured to subjugate it; but in spite of this it maintained its municipal liberties. During the course of the 13th and 14th centuries the city fell more than once into the hands of the Counts of Provence; and at length in 1388 the commune placed itself under the protection of the Counts of Savoy. Nice (called Nizza in Italian) participated - directly or indirectly - in the history of Savoy up until 1860. The maritime strength of Nice now rapidly increased until it was able to cope with the Barbary pirates; the fortifications were largely extended and the roads to the city improved. In 1561 Emmanuel Philibert, Duke of Savoy, abolished the use of Latin and established the Italian language as the official language of Nice. During the struggle between Francis I and Charles V great damage was caused by the passage of the armies invading Provence; pestilence and famine raged in the city for several years. It was in Nice that the two monarchs in 1538 concluded, through the mediation of Pope Paul III, a truce of ten years. 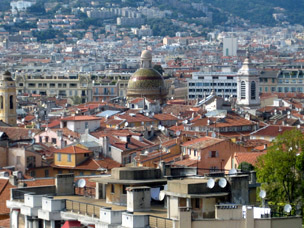 In 1543, Nice was attacked by the united forces of Francis I and Barbarossa Hayreddin Pasha; and, though the inhabitants repulsed the assault which succeeded the terrible bombardment, they were ultimately compelled to surrender, and Barbarossa was allowed to pillage the city and to carry off 2,500 captives. Pestilence appeared again in 1550 and 1580. In 1600, Nice was briefly taken by the duke of Guise. By the opening the ports of the countship to all nations, and proclaiming full freedom of trade (1626), the commerce of the city was given great stimulus, the noble families taking part in its mercantile enterprises. Captured by Catinat in 1691, Nice was restored to Savoy in 1696; but it was again besieged by the French in 1705, and in the following year its citadel and ramparts were demolished. The treaty of Utrecht in 1713 once more gave the city back to Savoy; and in the peaceful years which followed the "new town" was built. From 1744 till the peace of Aix-la-Chapelle (1748) the French and Spaniards were again in possession. In 1775 the king of Sardinia destroyed all that remained of the ancient liberties of the commune. Conquered in 1792 by the armies of the First French Republic, the County of Nice continued to be part of France until 1814; but after that date it reverted to the Kingdom of Sardinia-Piedmont. By a treaty concluded in 1860 between the Sardinian king and Napoleon III, the County was again ceded to France as a territorial reward for French assistance in the Second Italian War of Independence against Austria, which saw Lombardy unified with Piedmont-Sardinia. The cession was ratified by over 25,000 electors out of a total of 30,700. Savoy was also transferred to the French crown by similar means. Giuseppe Garibaldi, born in Nice, strongly opposed the cession to France (arguing that was not done with "universal" vote) and in 1866 there were even popular riots in the city, promoted by "Garibaldini" in favour of the unification of Nice to Italy. The Italian Irredentists considered Nice one of their main nationalistic requests and in 1942/3 the city was occupied and administered by Italy during World War II. The dawn of the 20th century was the arrival of a modern mode of transport. In 1900, the Tramway de Nice electrified its horse drawn tramway and spread its network to Menton and Cagnes-sur-Mer, equipping the city of a modern mode of transport. In the second half of the 20th century, Nice bore the influence of mayor Jean Medecin (mayor for 33 years from 1928 to 1943 and 1947 to 1965) and his son Jacques (mayor for 24 years from 1966 to 1990). On October 16, 1979 23 people died when the coast of Nice was hit by a tsunami. As accusations of political corruption against Jacques Medecin grew, he fled France in 1990 and was arrested in Uruguay in 1993, leading to his extradition in 1994. He was then convicted of several counts of corruption and associated crimes and sentenced to prison. In 2003, local head prosecutor Aric de Montgolfier alleged that some judicial cases involving local personalities had been suspiciously derailed by the local judiciary, which he suspected of having unhealthy contacts, through Masonic lodges, with the very people that they are supposed to prosecute or judge. A controversial official report stated that de Montgolfier had made unwarranted accusations. Christian Estrosi is the mayor of Nice since 2008 and again in 2014 which term will end in 2020. He is a member of the UMP party.